NBA Playoffs – The Defending Champion and the # 2 seed in the Eastern Conference the Cleveland Cavaliers and # 7 seed in the East the Indiana Pacers start the very first game of the 2017 NBA Playoffs Round 1 at Quicken Loans Arena in Cleveland. The CAVS dominated the Pacers in their regular season matchup with 3 wins and 1 loss, The Cavs are also highly favored of winning Round 1 of best of seven series against the Pacers. The Defending Champion dominated Game 1 winning every quarter of the first 3 quarters of the game and mostly leading from double digit throughout the entire game against the Paces but the scariest part of the team and seems the weakness of the Cavaliers is how they end in the 4th quarter? Once again the Cavs collapses in the 4th quarter, losing a double digit lead and eventually find themselves trailing in the 4th quarter after Jeff Teague made a 3 point basket that put the Pacers up by 2 points 105 – 103 with more than 3 minutes to play in the game. The Cavs regain the lead 107 – 105 with 2:35 remaining, while LeBron James adds a bonus free to up their lead to 4, with 1:17 remaining 109 – 105 Cavs. But Pacers superstars are not done yet Paul, George made a clutch 3 pointer to cut the lead to 1, 109 – 108 Cavs. The Pacers had the chance to win the game and stunt the Cavaliers after having another end game collapses in Game 1 but CJ Miles missed a game winner with 1.3 second remaining in the game that saved the struggling Cleveland Cavaliers from losing Game 1 of their best of seven series at home. LeBron James leads all scorers with 32 points, 6 rebounds and 13 assists while Paul George of the Indiana Pacers posted 29 points 5 rebounds and 7 assist. Game 2 is scheduled for April 17 (US TIME) at Quicken Loans Arena, will the Cavaliers find a solution of endgame collapses or will the Pacers finally take advantage of the Cavs weakness? 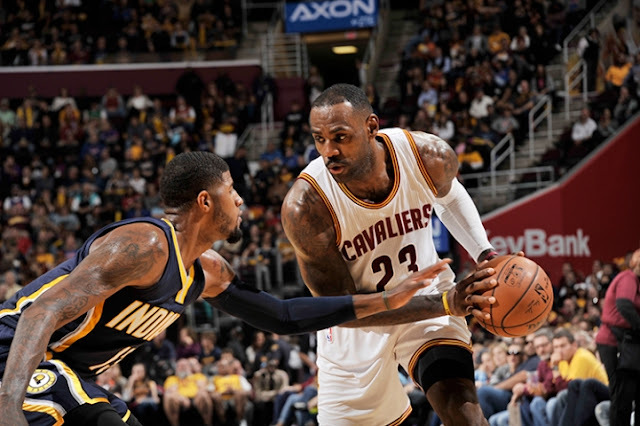 No Comment to " CAVS Survive a Thrilling Endgame against Pacers in a 109 – 108 win "